Rating is 5 (based on 156 reviews). This Electronic Navigation course is the world's only true interactive course where you learn all the instruments you might have onboard a sailboat. The exercises are designed so that you actually interact with a simulated GPS chart plotter and get inside the workings to REALLY understand how to maximize the information being presented to you. With ease, you'll implement navigation techniques like setting your autopilot to track a waypoint or tack perfectly on a layline. You are also introduced to newer technologies like AIS, MARPA and Weather GRIBs and shown how to effectively use them. Module 1 emphasizes that electronic navigation is an aid to the good sailor’s senses but can not replace them. Module 2 introduces and brings back some of the basics that you should already be familiar with in regards to navigation. Module 3 is an in-depth discussion of wind. 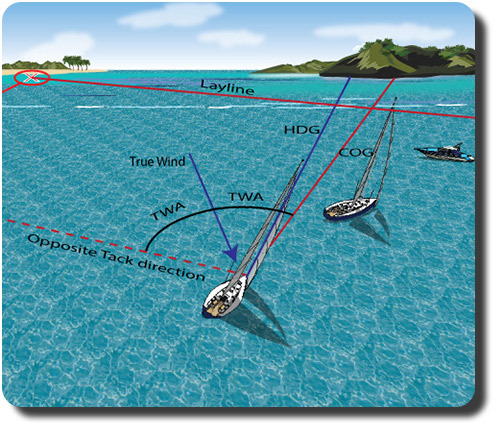 In particular it delves into the calculation of true wind and shows how important true wind direction is when navigating. Module 4 is all about boat speed. How to navigate using optimum speeds and how to find your best course to achieve your destination in the fastest time. We define velocity made good on course and velocity made good upwind. Module 5 prepares you for the shotgun of jargon that will be delivered in module 7. 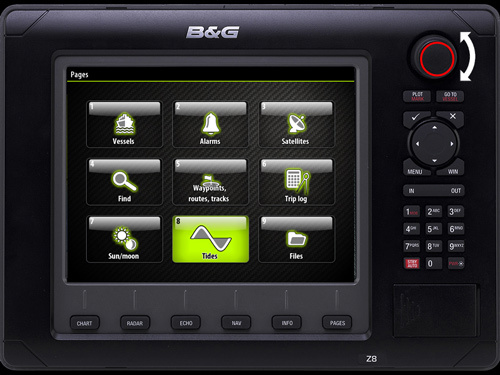 Module 6 introduces technologies such as AIS, RADAR and Weather GRIBS and electronic chart overlays. Module 7 is a step by step walk through of a real GPS chart plotter unit. You’ll gain the confidence, working knowledge and user experience, through various animations, to fully work a chart plotter device and apply this to your sailing navigation. Module 8 will round everything out so that you’re confident in your ability to navigate using electronic instruments. This is an essential safety and knowledge course that will also make you look good when operating electronic equipment around others. This course also comes in a downloadable PDF format which you can access for free after your investment. Today's Investment: Free with the Bareboat Charter Master Bundle of Courses. NOW you may also download the Electronic Navigation Course material (without the test or test credit) from our Sailing Apps store via iTunes. The App is in an eBook type format and is also fully interactive and full of animations. If you have an iPad, get the App. You can then take the test and get credit using our iPad testing App. 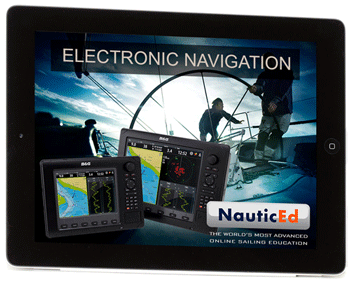 If you're going bareboat chartering, doing local or long distance cruising or any type of yacht racing, you should really be investing in this Electronic Navigtion course, and for the price, who can argue with that? It's a well put togeather course and you're going to like the interactive components. Get it now by clicking on the Register Button above or below. OR get this valuable course free with the Bareboat Charter Master Bundle or courses! This GPS interactive animation will show you that you can easily view the tide for your area. Click on the image then follow the red square touch points to run the animation. Module 7 has 20 such animations to help you get into the workings and really understand such a device. By the time you complete this Module alone you'll have full cofidence in operating a GPS chart plotter with multiple sensors networked in.